With mighty volcanoes and seemingly endless tea plantations, it’s a place of brilliant natural beauty. One plus point: it’s breezy almost-temperate climate! 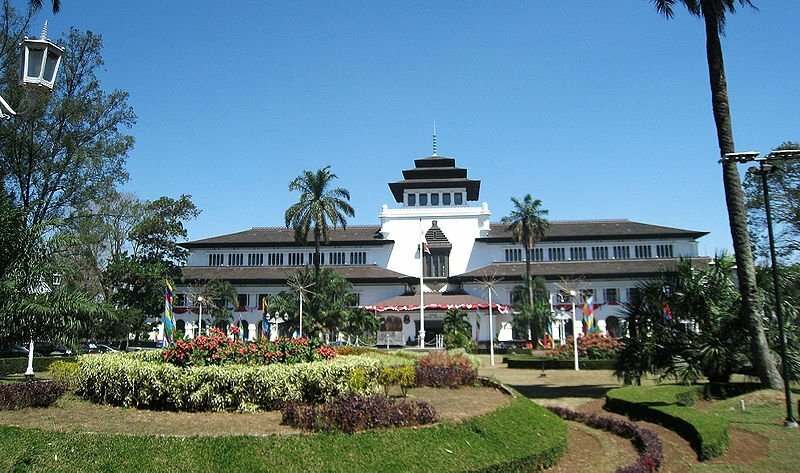 The capital of Indonesia’s West Java province, Bandung stands as a sturdy tribute to how far this nation has come. With mighty volcanoes and seemingly endless tea plantations, it’s a place of brilliant natural beauty and still in its infancy stages of progression. Remnants of eras long past can be found in tattered ruins and respected monuments. If you’re eager to soak in new cultures, spectacular natural attractions and historical landmarks, here’s a 3D2N guide to Bandung and what it has to offer (minus the modern marvels). Let’s begin some 50km away from the city centre, where the White Crater resides. 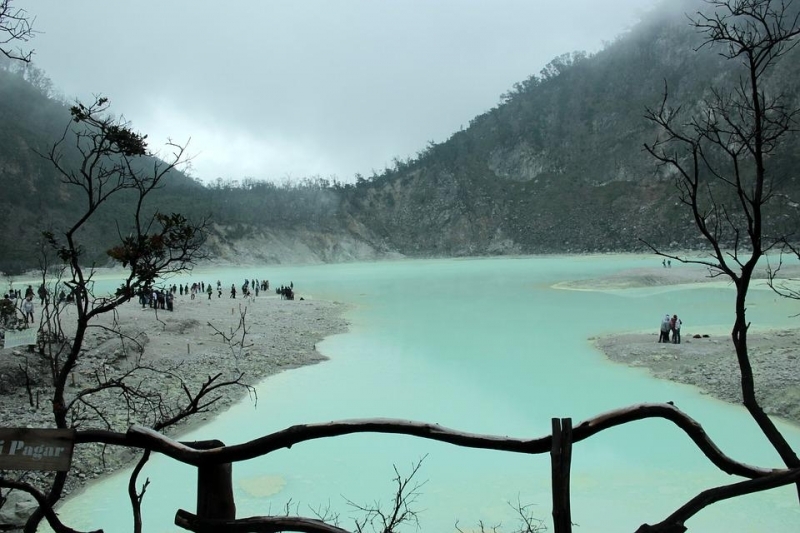 No trip to Bandung would likely be complete without taking a gander at this colossal, striking crater lake. 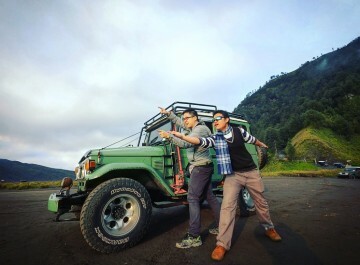 Attracting locals and tourists alike, residents refer to this giant as Kawah Putih. It’s better to leave your hotel by 6 am to avoid traffic. It’ll take about 3 hours and you can engage drivers from tour agencies to take you there. Along the way, tea plantations and bright strawberry farms dot the scenic landscapes that can be found on the ride to your destination. Heading back to the city now, it’s time for some history. Villa Isola (now known as now Bumi Siliwangi) is a huge, unique-looking structure that’s perched on the northern part of Bandung. It overlooks a breathtaking view of the city’s skyline and was built by an Italian millionaire in 1933. A landmark that you shouldn’t miss. Dinner on day 1 will be served in a vast compound that’s quietly nestled on a lush hill. 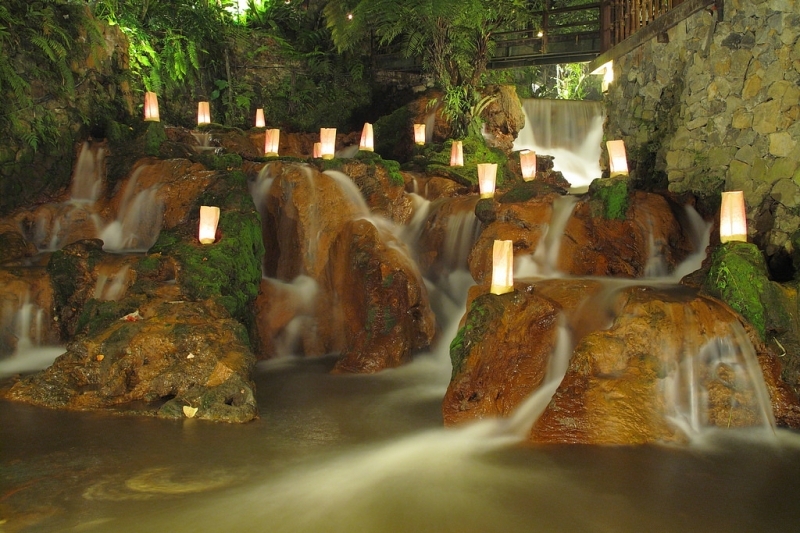 Known as Kampung Daun, this popular eatery resembles a traditional village filled with rivers and gardens. Charming traditional huts are present in the dining area and this can all get you in the mood for some authentic, Sundanese cuisine. Get ready for a remarkable experience to go along with a lovely meal. 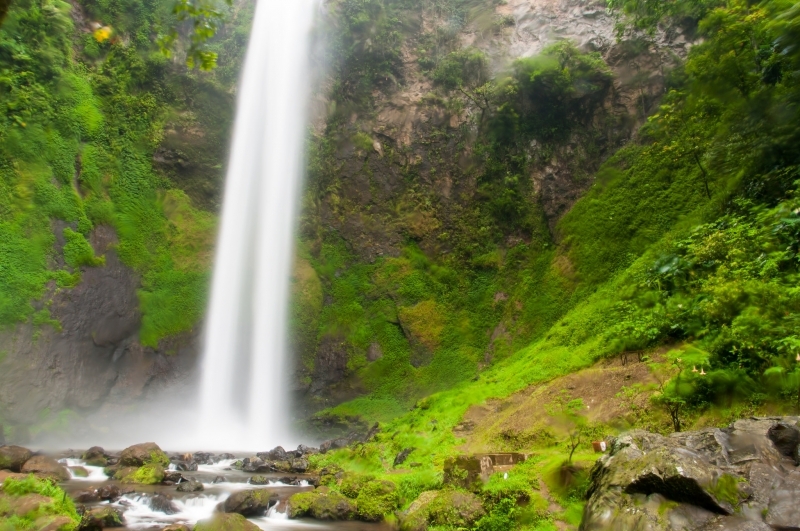 Today will consist primarily of natural attractions, of which the first will be Cimahi Waterfall. Standing at a height of about 87 metres, it’s one of the highest waterfalls in Bandung and the first to actually have coloured lights integrated for night-time tourism. 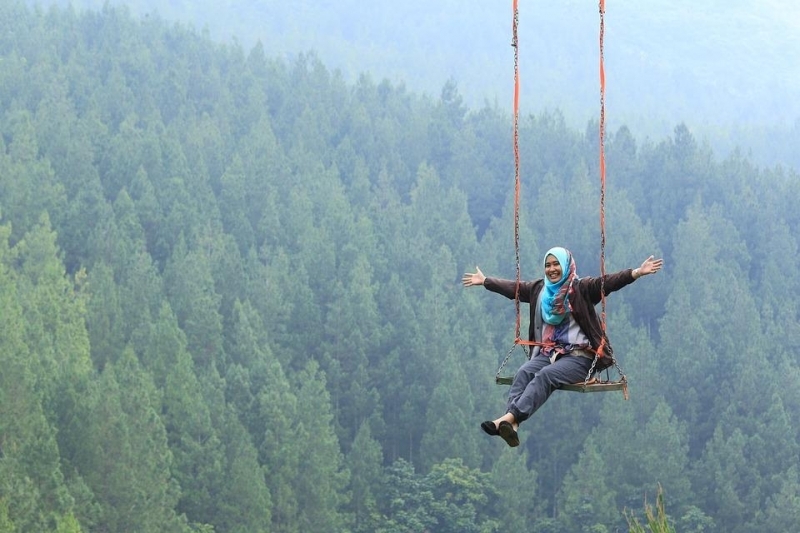 Cimahi is located right by a highway but its sheer presence can help you forget that you’re anywhere near civilization. 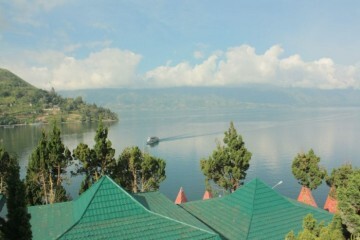 Next, in the Ciwidey village, located at an altitude of about 1600 metres above sea level, the Petenggang Lake remains one of Indonesia’s most popular natural landmarks (especially on the weekends). A cool forest that can hit average temperatures of 10 degrees C can be explored on the eastern side of this colossal lake while a lush tea estate can be seen reaching far out to the west and south. This site is also a popular boating spot and the Cimanggu Hot Springs are about a 30-minute drive away. Feeling hungry yet? 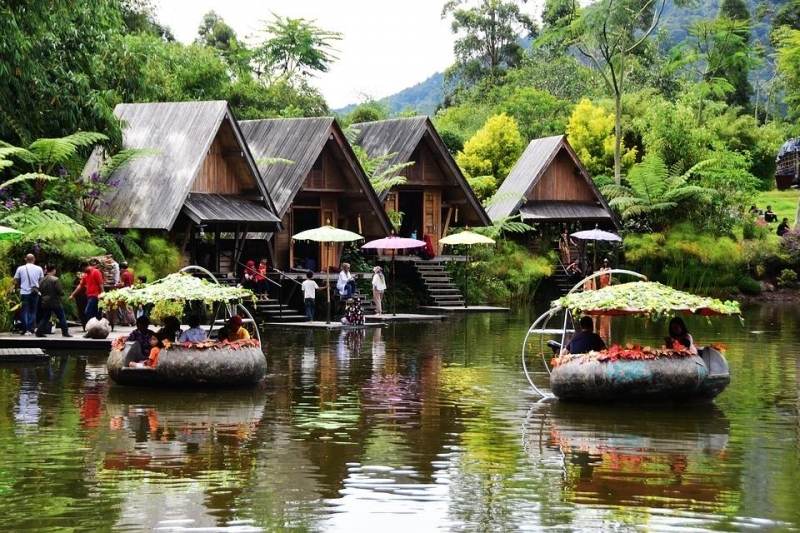 Dusun Bambu – a large family park and resort – offers more than just cosy lakeside cabanas and lavish dining rooms. Yup, you just might find that the food here is absolutely delectable, with a large menu of authentic Sundanese cuisine to complement the tranquil nature that surrounds you. 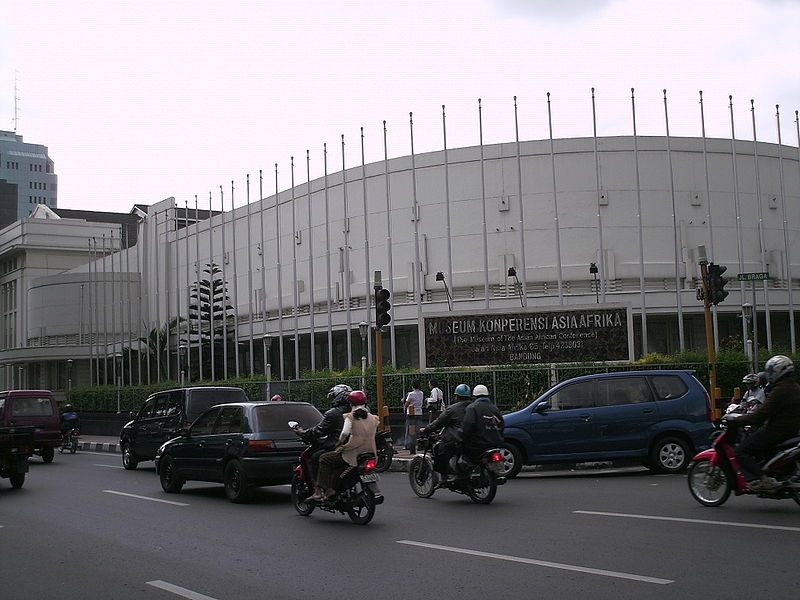 On the last day of this journey, we visit the Asia-Africa Museum – one of the most prominent historical landmarks in Bandung. Here, you can learn about the country’s intriguing past. 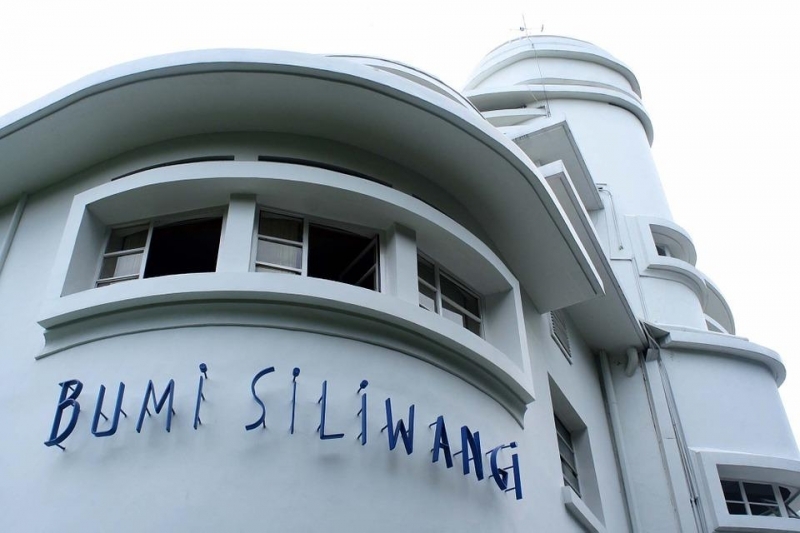 This spot held the first intercontinental summit in Bandung which took place in 1955 (after the Second World War). Rich in history, it’s located on Asia-Africa street in front of an old bank decked out in Dutch architecture. Next up, the Historic Gedung Sate building is a public structure that was designed according to a neoclassical design which incorporates native Indonesian elements. Its creator is a Dutch architect named J. Gerber, who completed the landmark in 1920. Its unique aesthetic (including a sharp roof ornament and meticulous detail) help set it apart and establish it as a timeless masterpiece. If all that history has got your tummy growling, consider venturing into the heart of the city, just a few blocks away from a key shopping spot to head on to Sangkuriang Restoran. This eatery boasts an impressive décor with unexpected landscaping that blows you away in an instant. 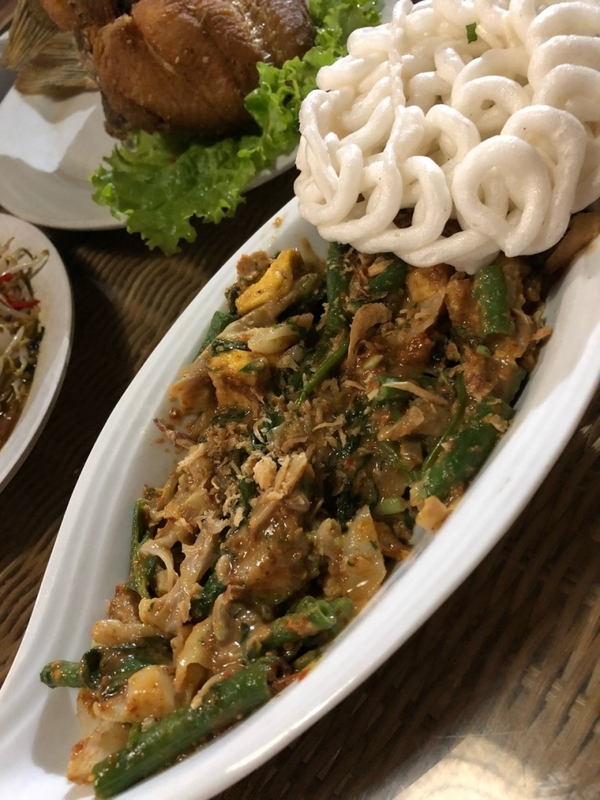 Here, you can expect to find local Sundanese dishes with hints of Chinese flavour and small huts surrounding a well-tended garden that help craft a relaxing setting for diners. This 3D2N guide is designed to help you catch glimpses of the hidden (or not so hidden) gems within this incredible destination. Bandung is a melting pot of culture, history and nature that blends into a rainbow of sophisticated beauty beneath the modern shell of a grand city. Nature, food and history await! Trying to get Rauf’s attention? Just say one word…roadtrip! Coming from an international background, he’s always felt at home in the midst of different people and cultures. Whether discovering historical gems or indulging in awesome food, he feels out of place if he’s not ‘out of place’ at least once a month. With a broad array of interest, Rauf likes to bask in knowledge, read, write, box, cook, look at art and have deep deep discussions on mind-altering topics. Kimberly shares her amazing 5 day adventure in Sabang. "Don’t come looking for a holiday, that’s Bali, or empire builders, that’s Java. Sumatra is an adventure, the kind of demanding ride that requires a dusty knapsack and tough travelling skin." - Lonely Planet Indonesia. Consider a 4D3N trip to the East Java region of Indonesia to view these two majestic landmarks!